Zakk Wylde and Black Label Society are back. The metal outfit have announced a new album, entitled Grimmest Hits, and unveiled the music video for its first single, "Room of Nightmares." 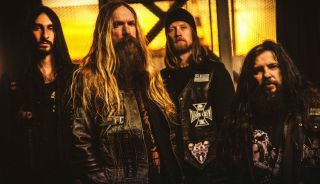 Black Label Society have premiered the music video for their ballad “Angel of Mercy.” The track is off the band’s latest album, 2014′s Catacombs of the Black Vatican. Listen: Black Label Society Streaming New Song, "My Dying Time"
Black Label Society are streaming a track from their upcoming album, Catacombs of the Black Vatican. Check out "My Dying Time" below and tell us what you think!